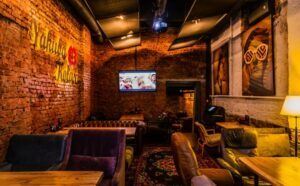 For a long time, hookah, or shisha bars have been beloved places among locals to visit in Minsk. Every year, it's getting more and more of them and, of course, each hookah is trying to surprise its visitors with something exquisite. That is why we have selected for you top 7 shisha bars to visit in Minsk. "Only smoky hookahs, only high-quality music and only the best guests in the hookah Lab" - come and you will see everything with your own eyes. " The slogan of the "Lab" has intrigued us. After all, each researcher will be attracted by such a assertion! So, true or false? Let's find out! Let's start talking about the atmosphere. If you are tired of the traditional oriental style of hookahs, then you should definitely like this place: the whole interior is decorated in a loft style. Black and gray tones of the walls animate the elements of pop art and colorful paintings. Large soft sofas and high-quality music complement the atmosphere of comfort. In addition, the hookah "Laboratory" offers guests a wide selection of board games, as well as games on the console for an even more pleasant pastime! In the “Laboratory”, they focus mainly on hookahs - both classic and modern combinations and author’s versions are presented. Here you will find something to surprise both the novice and people, who are well versed in the hookah culture, because the hookah was named so not by chance. For guests, there is a wide choice: hookahs on water, juice, milk, alcohol, from a mixture of tobaccos. Experiments here are a usual thing, because Laboratory selects only the most talented masters for making shishas. The “Laboratories” menu is small, but the dishes are niurishing and tasty: snacks, burgers, hot dishes and shaurma. There is also a lunch menu. In addition, the "Laboratory" offers a large selection of alcoholic drinks and cocktails. But, in our opinion, the most important thing is that the “Laboratory” hookah has friendly staff and affordable prices. Are you going to Minsk for the first time? We have a couple of ideas where to stay at night. 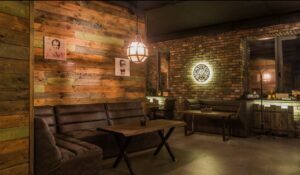 For the begining, HookahPlace, the largest network of hookah places in the world, is as popular in the world as Starbucks. All this creates the impression of the connection of all decorative elements with history, brings comfort and predisposes to calmness. What else do you need to relax? In addition, the HookahPlace has a piano and not only for the interior. HookahPlace Lounge Bar hosts live music nights. There are 2 game zones and game on PS4. Also in this place there is a professional table for playing kicker. The main thing you should know is that HookahPlace Lounge Bar offers a wide range of hookahs. Local shishas will certainly take into account your tastes, because the team of masters recruited only real experts, who will devote each guest to the hookah culture. 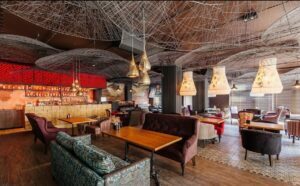 Menu and drink card are also good: menu consists of grilled dishes, and the bar can offer not only author's drinks, but each barman will be able to prepare a new drink to the taste of the guest. 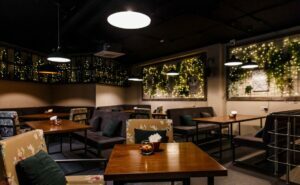 The “Tea drinker” lounge bar, which had opened recently, has already become a favorite place for Minsk residents and guests of the capital. What gives originality to this place? In addition to smoky hookahs, pan-asian cuisine, classic alcoholic drinks, themed cocktails, the guest is invited to plunge into the mystery of traditional tea ceremonies. The “Tea Drinker” will acquaint every visitor with the pacifying philosophy and culture and traditions of the tea ceremony. The tea card has Chinese puer, oolong, green, red and white varieties, as well as floral, berry drinks and fees from other countries. This place also promises to conquer the hearts of hookah lovers: collections from leading manufacturers, a variety of presentation forms, hundreds of flavor mixes — the presented set will satisfy even the most demanding guest. Everyone could enjoy pleasant pastime here. You can have a coffee break in “Tea Drinker”, cheerful meeting with friends or romantic dinner. Cozy lounge areas, dim lights, unobtrusive music — all this things create a unique atmosphere for pleasant leisure at any time of the day. On weekdays it is comfortable to hold a business meeting here, chat with friends or just be alone with yourself. But on Fridays and Saturdays, under the bits of dynamic dj-sets, "Tea Drinker" turns into a party place, where you can switch from the stern weekdays to the weekend. What about the main menu? The lounge bar is famous for its dishes made according to the traditions of the countries of south-east Asia (Korea, Japan, Vietnam, China, Malaysia and Thailand). Exquisite seafood, meat delicacies with oriental spices, nourishing noodles with fragrant sauces — the variety can amaze the most demanding gourmet. The main menu is complemented by a rich selection of classic and themed cocktails, as well as a decent wine list, brandy, whiskey and drinks. Reed more about the best cafes and restaurants in Minsk. The hookah network “Myata” (eng. Mint) has flooded Minsk for a long time and successfully “holds the brand”. After all, Mint Lounge is not just a hookah, it is a place where you can fully relax. Let's start with the “Mint” interior in the brutal Loft style: front windows from the ceiling to the floor, brickwork on the walls, rusty metal and barn wood. High ceilings, furniture and dim lights add comfort to every hookah Mint. The Mint Lounge offers the most varied recreation while keeping its individuality. In the afternoon you have the opportunity to drink a cup of coffee quietly, smoke a hookah, work at the computer, enjoy a lunch menu. In the evening, in a more informal atmosphere, you can sit in the company of friends. Guests can enjoy a wide selection of board games, including Poker Stars, UNO, Epic fights of battle magicians, Spyfall 2, Party Alias ​​and others. Are you a lover of the show? Then there are performances of vocalists and dj sets on weekends. The show program starts every Friday and Saturday at 20.00. 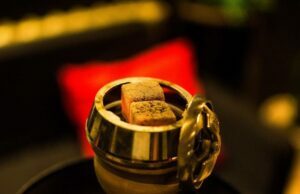 Mint Lounge offers more than 100 types of "fillings" for the truly high-quality hookah, so everyone should find something suitable for themselves. Mint cuisine is a mix of fusion American, European and Asian. It is necessary to try the dish "Chicken baby" and juicy pork tenderloin in provencal herbs. There are more than 40 drinks in the cocktail menu, most of them are made in the author's vision of the barman. 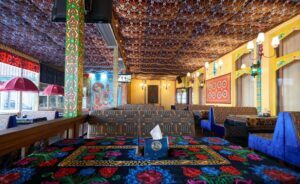 For lovers of frequent evenings with hookah, this place may be ideal thanks to a discount program with discount cards for 10, 20 and 30% for hookah. After all, the greater the discount - the more hookahs you can take and have a better time! HookahDeli has opened in Minsk over a year ago and immediately attracted fans of minimalism. The minimalist-style interior of this place, quiet background music, dim light and friendly staff dispose to rest from stormy everyday life. Above all, it is very pleasant that staff knows their regular guests by sight. This creates the feeling, that you have come to your home. “HookahDeli knows all about hookahs, if not all, then almost all,” — the institution says. And we completely agree with this. And it’s important, that the prices here are the most democratic in Minsk. HookahDeli is ready to offer you an extensive taste palette: about 80 names of tobacco at prices that will be much lower than their competitors. You can choose classic hookahs or recently popular "new school" hookahs. Hookah masters will prepare a mix specially for you according to your most courageous wishes. The menu in HookahDeli is presented mainly by light dishes: salads, burgers and sandwiches, meat and fruit cuts. It’s especially recommend to try Chinese tea for a drink. And for those, who prefer something stronger, HookahDeli offers a beer card: Belarusian, German, Belgian, Mexican beer. Are you bored of the slavic routine of capital institutions? Then you should look into the Chaihana! Lounge cafe " Chaihana" is a completely new format of institutions. The atmosphere of this place impresses. Do you want to turn up in the eastern country for a while? Then you are at the right place! Chaihana successfully combines eastern comfort and decor with national cuisine and culture. In Chaihana you will sink into the world of an oriental tale: colorful pillows and handmade carpets, lampshades, bright curtains, hand painted plates. All elements of decor were brought from Uzbekistan. In Chaihana you can order a real oriental hookah. Who else can know about hookahs more than people, who had smoked hookahs from time immemorial? The main accent in this cafe has made on uzbek cuisine with a slight european sprinkle. Here you can try such delights as lagman, manti, chak-chak, uzbek baklava, four types of pilaf, shurpa, samsa, chuchvara, choose from a wide variety of tea for your taste. Bars on Zybitskaya street each year surprise their visitors. The first of its kind bitter-bar “Flowerbed” broke into the life of the capital with its own twist. “For fans of drinks — author’s cocktails and tinctures, for hungry ones — burgers and steaks, for fans of smoke wafts — hookahs, tuned to dances —parties with the city’s best DJs,” — Flowerbed said. The interior of the Flowerbed reflects the name: the décor was made of wood and greenery, there are installations of artificial moss, and all the furniture is custom-made by the Minsk master Jony Flaer. 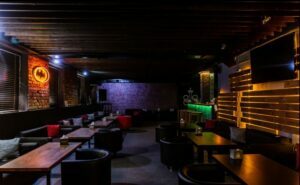 The bar consists of two floors and is zoned so that there is more movement on the first and a chill-out zone on the second. Downstairs there is a large contact bar counter, high tables, and in the evening the hall turns into a dance floor. Upstairs you can comfortably accommodate even a large company, order a hookah and spend the evening in a more relaxed format. The location of the bar obliges it to be the place, where you can spend unforgettable weekends: on Fridays and Saturdays there are best DJs parties (disco / funk / retro / r`n`b / hip-hop / rock`n`roll) from 23:00 to 4:00. The menu in Flowerbed specializes in burgers. Moreover, the recipes were worked out as they should: there are birgers with beef, pork steaks or duck. Sauces are created on the basis of Becherovka and plums on wine. Craft buns are used from the Brioche bakery. Steaks and salads aren’t less popular. Have you seen a bar without a bar card? An accent in Flowerbed is made on cocktails based on bitter tinctures and vermouths — Becherovka, Jagermeister, campari, planear, amaro and others. Especially popular is the brand shot "Dill" on the basis of Becherovka, vodka and dill. You should ty craft beer and author tinctures on pear, plum, currants and other gifts of domestic gardens. And there are also interesting cocktails: “Horseradish for Mary”, “Feast of Bezrukov”, “Romance with Parechka”. Do you like bars? Then you should see this. It was the top 7 hookah of youth Minsk 2019. Visit new places, have fun with friends! We hope that our article will help you to find pleasant places.